I walked into E. Massey’s Barber shop because I needed change for the bus and met some of the finest brothers with the cutest accents. Todd, Mike, Holiday and the customer, Lonney. It was inspiring to see that they were all African American men because in New York where I am from, the barber shops are usually owned by latino brothers. I never have a reason to walk into barber shops and tend to think it’s more of a man’s world, so I really did try to avoid going into Massey’s but the Trophy shop next door did not have change. When I entered, I felt kind of self-conscience because I was the only female in there but they made me feel like I was welcomed. I can see why some New Yorkers glorify this southern mentality. Hi, do you have change for 5 dollars? And after that, change for a dollar? I need change for the bus. Oh, I don’t have change for a dollar but if you use the vending machine, you can get change. Yes. Can I take your photo? No, I just want to take the bus. I started taking photos of them. Then one of them took out their phone and begin to photograph me. In all my years of taking photos of people, this never happened, so it caught me off guard. It made me smile. When I was leaving one of them, Mike, walked me out the door and made sure I was going in the right direction. I was walking near the warehouse’s in the Bronx. I held the door open for a business owner and guess what he gave me? A huge chunk of natual African Black Soap along with an eight ounce bottle of shampoo. When you are traveling, the longer you stay away from home, the more you begin to get used to where you are staying. It is usually in the beginning of your stay, while your brain is still making the adjustments, that you learn the most (about the people and the place) with great eagerness. I went to three fairs while in Argentina and before each fair Dr. Anderson encouraged us to talk to the merchants and try to bargain with them- not shake them down- but make fair bargains with them. 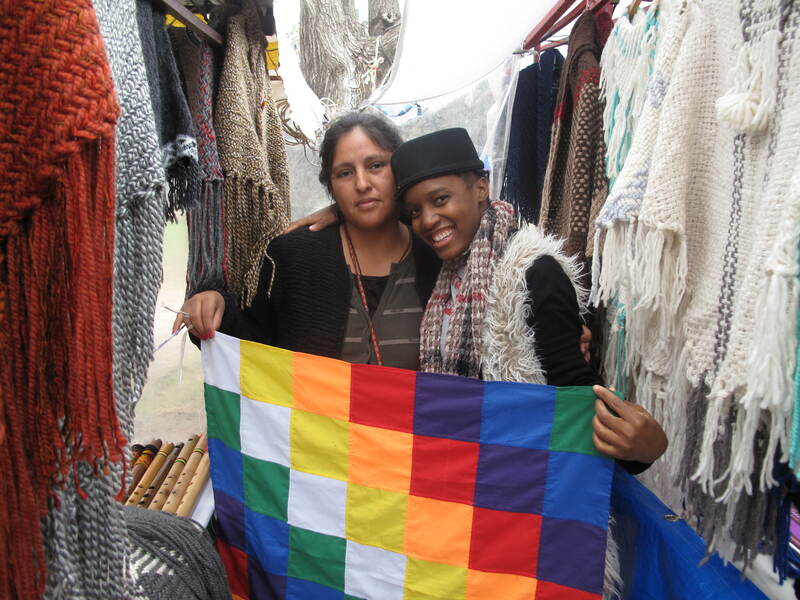 I made great bargains at all the fairs but it was at the Plaza Francia Fair I was able to not only buy two shawls at a great price but to connect with the sales lady and learn the meaning of the indigenous people’s flag. The 7 colors represents the 7 days and in total there are 49 squares. 4+9= 13. The 13 represents the 13 months of the year of the original people. They don’t / didn’t have 12 months. It’s 13 months because each month has 28 days like the cycle of the women. There are also 13 bones in the column and 1+3 = 4 which stands for north, south, east and west. The flag also stands for the elements of life: fire, water, air and the earth. The top of the flag stands for the head, the two sides stands for the hands and bottom for the feet. In the original language, feet and earth meant the same thing. The center of the flag stands for the connection of the earth to the unborn babies and the harmony of the earth and 4 elements. I think I may have missed something in translation so I made a video of her teaching me and posted it on youtube. Of course while I was in Argentina, I wanted to buy at least one hat. I found a small hat shop in San Telmo. The name of the shop was La Fundamental and in the words of the apprentice who sold me my hat (the one I am wearing in the photo) it is a meaning close to the English meaning for the same word, but it’s also “funda”(cover)+”mental”(mind, from the mind) so the pun is “the cover of your mind”, because we sell hats lol. I was in love with the shop the moment I walked it. It had a lot of hats of all shapes, colors and sizes and I could see that more were being made. I not only liked the shop because of it’s merchandise but also because of the employees. The young lady that is smiling with me name is Mon. She was so sweet and I felt we were friends for a long time. 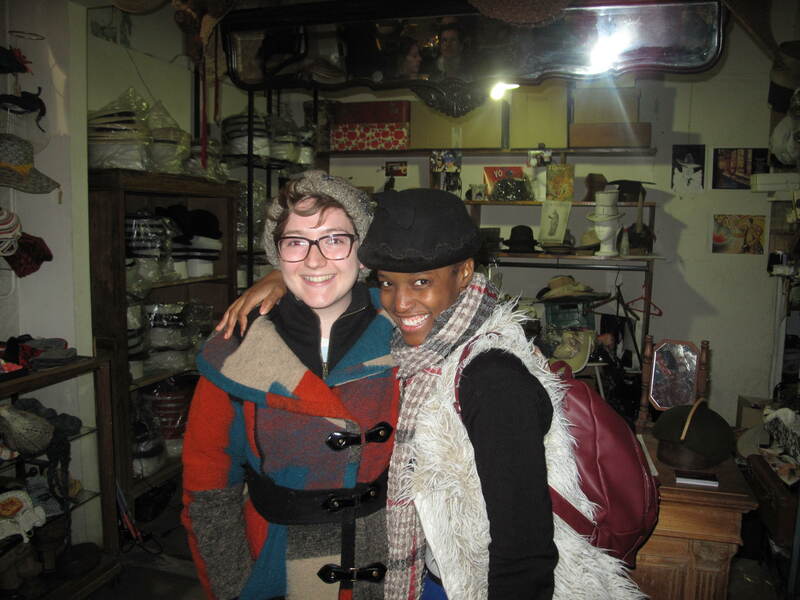 She told me the owner of the shop was not there and she is an apprentice, learning how to make and mend hats from the owner. When I emailed Mon and asked her if she remembered me, she replied ecstatically: Of course I remember you! You took one of my first creations to New York, a city that I love and that has given me friends and family. I hope to go back there soon. Of course when I travel back, I’ll make my way down to that fancy hat shop.